NATO: 'Absolutely No Truth' To Report About Push For Raids In Pakistan : The Two-Way While The New York Times reports that U.S. military commanders want to send Special Forces troops into Pakistan, a spokesman for NATO forces in Afghanistan says that's not true. October 2009 file photo: U.S. Army Specialist Damyon Miller from the 3rd Platoon, Charlie Company, 1st Infantry Regiment, 5th Stryker Brigade Combat Team, 2nd Infantry Division, mans a machine gun mounted at the back of a Stryker vehicle as the large armored convoy patrols near the Afghanistan and Pakistan border. "Senior American military commanders in Afghanistan are pushing for an expanded campaign of Special Operations ground raids across the border into Pakistan’s tribal areas, a risky strategy reflecting the growing frustration with Pakistan’s efforts to root out militants there. ... 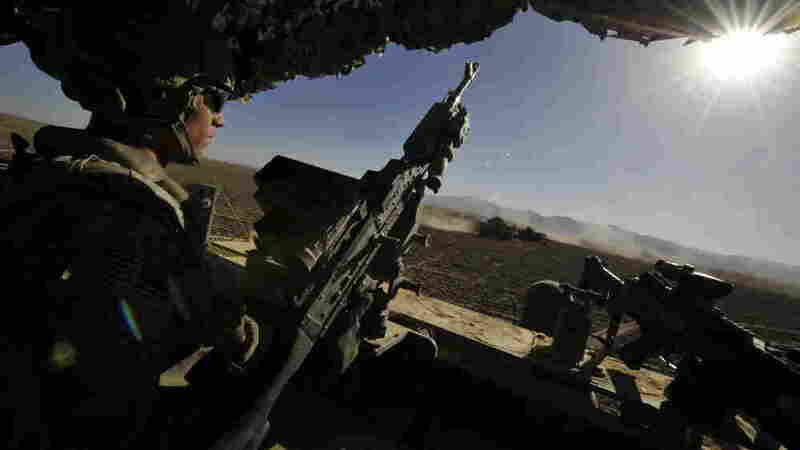 The plan has not yet been approved, but military and political leaders say a renewed sense of urgency has taken hold, as the deadline approaches for the Obama administration to begin withdrawing its forces from Afghanistan." "The NATO force in Afghanistan denied Tuesday that the U.S. military intends to carry out ground raids inside Pakistan in pursuit of insurgent leaders hiding there. ... U.S. Navy Rear Adm. Gregory Smith, the deputy chief of staff for communications for the NATO force, said there was 'absolutely no truth' to reports of planned ground operations by U.S. forces inside Pakistan." "Pakistan ruled out the notion of any foreign troops operating on its soil, with its top diplomat in Washington stressing that Pakistani forces are capable of handling the militant threat within the country’s borders."